A few months after launching the Galaxy S6 and the Galaxy S6 edge, Samsung unveiled a rugged version of its flagship smartphone. Called the Samsung Galaxy S6 Active, the AT&T-exclusive handset has almost the exact same features and hardware as the standard version of the Galaxy S6, but keeps all of them wrapped in a shock and water resistant body. 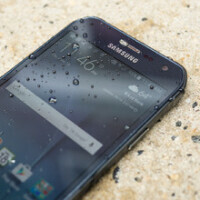 During our Samsung Galaxy S6 Active review, we found that it's an excellent performer with great endurance. If you're wondering just how resistant the Samsung Galaxy S6 Active really is, the fellows from Unbox Therapy have just posted the results of a unique drop test. Essentially, the Samsung Galaxy S6 Active was used, for extended lengths of time, as a hockey puck. First, the hockey teams warmed themselves by passing the puck Samsung Galaxy S6 round, then used it for some one-on-one situations, proceeded to shoot the phone in full force, and then used it for a de-facto hockey puck during a short scrimmage. As you can notice, the Samsung Galaxy S6 Active behaved beautifully in these extreme environment, managing to survive both the passing and the shooting test. Sure, the handset did get destroyed during the full-blown scrimmage, but that's to be expected from any fine electronics device no matter how rugged. What do you guys make of this test? Did you expect the handset to escape fatal damage for as long as it did? Why did they have it in a case? I've never seen a torture test where the phone was protected. At that point aren't you just testing the case and not the phone? I would have that phone right now if they had it on T-Mobile. 64gb for me. It's a little ugly but I prefer function over form. They thing has a great processor, really good battery life and a great screen. Plus it's rugged. Rugged case are uglier and offer no more protection to scratches or drops. A great phone for sure. That's my favourite phone of the year. Practical design, great specs and out of the world battery life. Also the best phone I'd vote for 2015 too. It reminds me how far the S6 from being great. Hope Samsung got the clue. Anyone know where to buy this in europe?